Many of us look forward to the warmer weather during the summer time. Perhaps it may be that we have just experienced a long winter or we might just appreciate getting together with friends and family and spending some time outdoors. Whatever the case may be, summer can be an excellent time to reconnect with others. The warm weather provides the best opportunity to do so. Unfortunately, the warm weather can also bring some problems along with it. Those problems include a variety of insects that could quickly ruin any type of outdoor activity. At the top of the list is mosquitoes, and when they are around, it can send everyone running indoors. Unfortunately, they are a part of summer weather but that doesn’t always need to be the case. In fact, once you know this simple trick, you will be able to say goodbye to mosquitoes for the entire summer. Rather than reaching for a chemical that you spray on your skin, you can use this simple technique to repel mosquitoes and keep them at bay. It is all natural, so you don’t need to worry about how it is affecting your health but best of all, it really works. Once you put this in your yard, you will find that the mosquitoes are no longer a problem. That is why you will want to keep several of these on hand for any type of outdoor occasion. Fortunately, this simple technique uses items that you likely already have around the home. It is quite simple to make and once you put them together, you will never want to be without them. Nobody wants to have mosquitoes around. They are annoying and can even carry some serious diseases. Make these simple Mason jar repellents today and say goodbye to mosquitoes once and for all. Slice your lemons and limes into rounds. Add about 3 slices of lemon and lime to the bottom of each mason jar. Add 2 sprigs of fresh rosemary to the jar. Add 3 more slices of lemon and lime. Add 7-10 drops of Lemon Eucalyptus Oil. 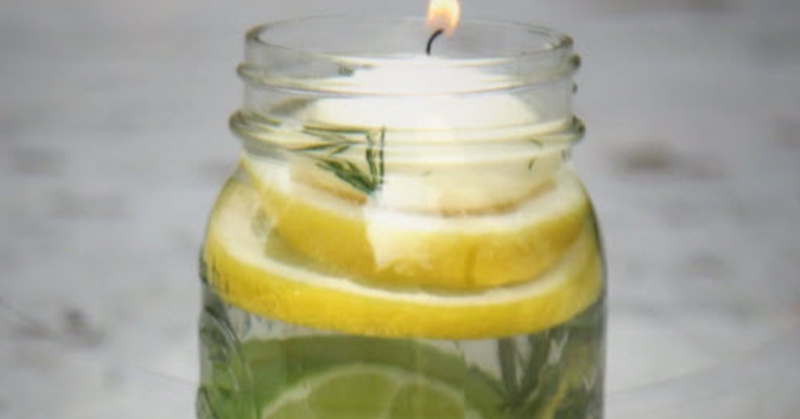 Place your floating tea candle on top and light when you’re ready to use!